T-Mobile USA is betting big on its second Android smartphone, the MyTouch 3G, as it officially launches the device making it its flagship smartphone to compete against Apple’s iPhone on AT&T. The company announced the MyTouch 3G, which is essentially the same phone as the Google Ion or the HTC Magic, last month. And on Wednesday T-Mobile made the device available for pre-orders to its existing customers. The device will be generally available starting August 5. The MyTouch is the second smartphone the carrier has introduced that uses Google’s open-source mobile operating system, Android. T-Mobile introduced the world’s first Google Android phone, called the G1, last fall. And so far the company claims it has sold more than 1 million devices. Thinner and slightly smaller than the G1, the MyTouch features a large 3.2-inch touch screen with 3G and Wi-Fi support. The device comes loaded with several applications including integrated Google Apps, but it also can access the Android Market, a virtual application storefront where users can have their pick of some 5,000 applications for downloading. Executives at an event here Wednesday made no bones about pitting the MyTouch against Apple’s popular iPhone, which is sold exclusively for AT&T’s network in the U.S.
“My hope and expectation is that this device will be compared to the iPhone,” said Denny Post, senior vice president and chief marketing officer at T-Mobile USA. It’s easy to see the similarities between the phones. Like the iPhone, the MyTouch has a touch screen with a virtual keyboard. And it has access to a lot of very cool applications. But executives also point out what they consider important differences between the MyTouch and the iPhone. Personalization is the big buzzword the T-Mobile marketing folks have used in launching the new phone. They claim no two MyTouches will be the same since users can customize their devices to tailor their own lifestyles and needs. The customization goes beyond the ability to download different applications, and also includes the ability to change the background on the phone’s home screen and the ability to organize application icons on the home screen. While iPhone users can drag and drop icons and customize their sleep mode screens, the home screen essentially looks the same on all iPhones. Whether or not this differentiator is a big deal to consumers is yet to be seen. Another possibly more important differentiator is the fact that the Android software on the MyTouch allows users to easily switch between multiple applications that are open on the device. The software also allows information from one application to be fed or viewed in another application. For example, there is a little user bar at the top of the phone’s screen that shows the temperature and weather. It also has alerts for new e-mails and text messages as they come into the phone, without interrupting the application that is going. Of course, the MyTouch is not the only smartphone that offers this kind of application multitasking. The Palm Pre announced earlier this summer for Sprint Nextel’s network has gotten high marks for its ability to multitask. But Andrew Sherrard, vice president at T-Mobile, says that what sets the MyTouch apart from the Pre is the Android Market mobile application store, which already has 5,000 applications. At the heart of the MyTouch is the open platform Android software, which was developed by Google. And because it uses the same operating system developed for the G1, the features and functionality available on the MyTouch are not much different from the G1. And it’s likely that other Android devices that will be launched on T-Mobile’s network and other operators’ networks later this year will also be similar in terms of functionality because they use the same operating system. But instead of lumping multiple Android devices together, T-Mobile will be focusing much of its marketing on the MyTouch as its flagship device. This makes sense from a competitive standpoint as other wireless operators highlight their own exclusive handsets. Apple has the iPhone. And Sprint has the new Palm Pre. Now T-Mobile will focus its marketing on the MyTouch. The G1, the first Android phone to come to market, launched in November last year and has been a major success for the carrier. But the phone has mostly appealed to early adopters, Post said. The MyTouch will be targeted at the mass market. As part of its push to make the MyTouch its premiere smartphone, T-Mobile has put extra effort into training retail staff to help new customers customize their phones and add new applications. And even though the Android Market today is only a tenth the size of Apple’s App Store, it’s expected to grow rapidly as more Android devices come to market. And when that happens, Post says there will be a great need to help consumers to sift through the chaos and discover new applications. 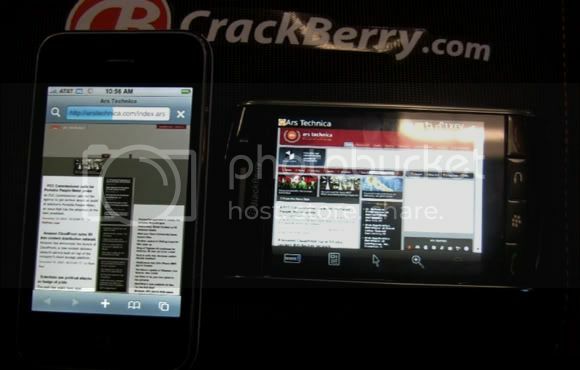 Two of the greatest Phones releases are being tested on Internet browsing, the head to head has been done by CrackBerry, and they have a video to go with it, which you can see below. He has done a comparison like this before, but with the BlackBerry Bold vs. iPhone 3G. In this follow video you will see both phones being tested on well known websites such as NYTimes.com, WSJ.com, CrackBerry.com and ArsTechnica. Clearly, there are legitimate reasons why such functionality should exist – although slightly fewer for why it’s undocumented and downright concealed – including the possibility that Apple can update iPhones with a sort of anti-malware by listing known ‘bricking’ programs in the blacklist. However, it demonstrates that even a ‘jailbroken’ iPhone might not escape Apple’s clutches for long – and how sure can you be that Installer.App or your favourite non-Apple approved software won’t hit the blacklist once it’s activated? Anyone here worried about the possibilities of a hidden remote app killer developed by Apple, or does the Cupertino company just have your best interests at heart? 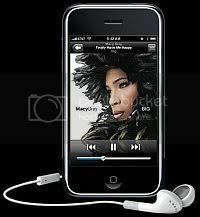 The new 3G iphone was announced today at the WWDC 08 in the USA. A white version of the iphone will also be available. The new amazing iphone has a built in GPS, It is slightly thicker but not that much. It also has an app store where you can download applications. How does the iPhone 3G tackle the challenges? 3G = faster data downloads, perfect for Safari and Mail. Comparing download speeds between 3G and EDGE. 3G finished in 21 seconds. EDGE finished in 59 seconds. Apple has learned so much with the first iPhone. They have taken everything they’ve learned and more and created the iPhone 3G. Even thinner, black plastic back, solid metal buttons, same gorgeous display, camera, flush headphone jack, and dramatically improved audio. 3G-capable. 2.8 times faster than EDGE. Better battery life – 300 hours of standby, Talk-time 10 hours (as opposed to 5) on 2G networks, 5 hours of 3G talk-time (competition is 3 hour 3G talk time), 5 to 6 hours of high-speed browsing, 7 hours of video, 24 hours of audio.